Last week Twilio, the startup that makes it easy for developers to integrate SMS and telephony features into their own applications, made a significant pricing change: they dropped the price of each outbound SMS message to one cent (it used to be two cents per message). That may not sound like much, but given that some companies being built on the technology handle a huge volume of texts — including some of the group texting apps — it adds up. I was curious how much of an impact the pricing change could have on the service (after all, there may be some great ideas out there for which Twilio wasn’t previously a viable option), so I got in touch with the company. 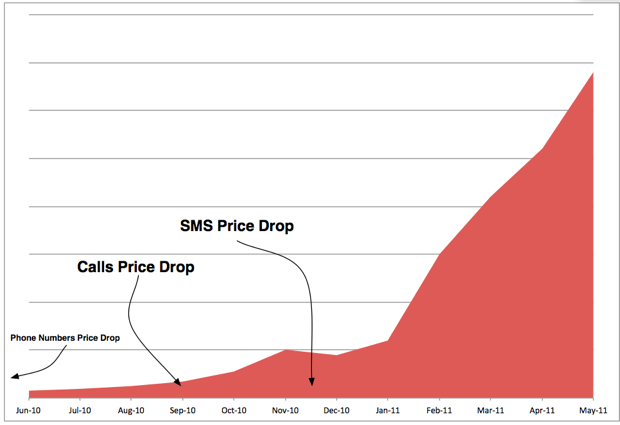 CEO Jeff Lawson says that Twilio isn’t sharing absolute numbers around the number of text message and voice minutes it’s dealing with, but he did provide the graph above the shows how each of the service’s previous price drops have spurred growth. Overall, each drop looks like it contributed to a marked increase, though there is one apparent outlier (it looks like usage went down in late November). As it turns out, the bump in November is from applications built during the 2010 midterm election. Lawson says that campaigns on both sides of the fence used Twilio to build applications, and that the Democratic National Committee did especially well using it, with “order of magnitude cost savings” on an app that was built in a day (you can see the case study here). Obviously these apps were only seeing heavy usage for a limited amount of time, which is why usage peaked and then dropped a bit. I also asked about the major inflection point you see around January 2011. Lawson says this is due to “boring stuff” — growth in new customers, and growth seen by existing customers. Though given how steep the change is, I’m guessing at least one of the customers really started to take off. Lawson also provided some other stats: he says that despite the fact that SMS shortcodes have been around for a decade, there are only around 2,000 of them currently active. In contrast, he says that 10,000 developers are currently using Twilio SMS (which launched a year ago). So what exactly allows Twilio to drop the prices in the first place? The company says that it can work out better deals as it handles more volume, and that it passes along those reduced prices to customers.